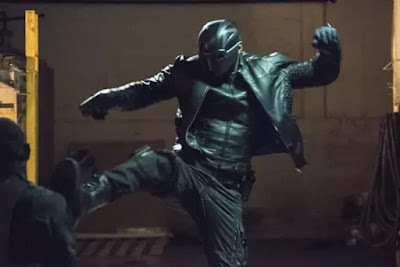 While #Olicity is enjoying domesticated bliss, the team formerly known as Team Arrow makes due with a powered-up Diggle in costume and helmet, a full-time crimefighting Speedy and Laurel back in black as Canary. The arrival of Damien Dahrk will probably force Ollie back in action, but this time as the Green Arrow (as the comic book gods intended). Arrow Season 4 premiere airs Oct. 7 at 8 p.m. ET on The CW. Check out the photo gallery below as well as the latest trailer as we approach the final countdown. MY NAME IS THE GREEN ARROW — Oliver (Stephen Amell) and Felicity’s (Emily Bett Rickards) blissful getaway is cut short when Thea (Willa Holland) and Laurel (Katie Cassidy) pay them a visit and tell Oliver they need his help back in Star City. The city has been attacked by “Ghosts,” assassins led by a dangerous man named Damien Darhk (guest star Neal McDonough). However, when Oliver returns, Diggle (David Ramsey) makes it very clear that he doesn’t want Oliver on the team. Thor Freudenthal directed the episode with story by Greg Berlanti & Beth Schwartz and teleplay by Marc Guggenheim & Wendy Mericle (#401).